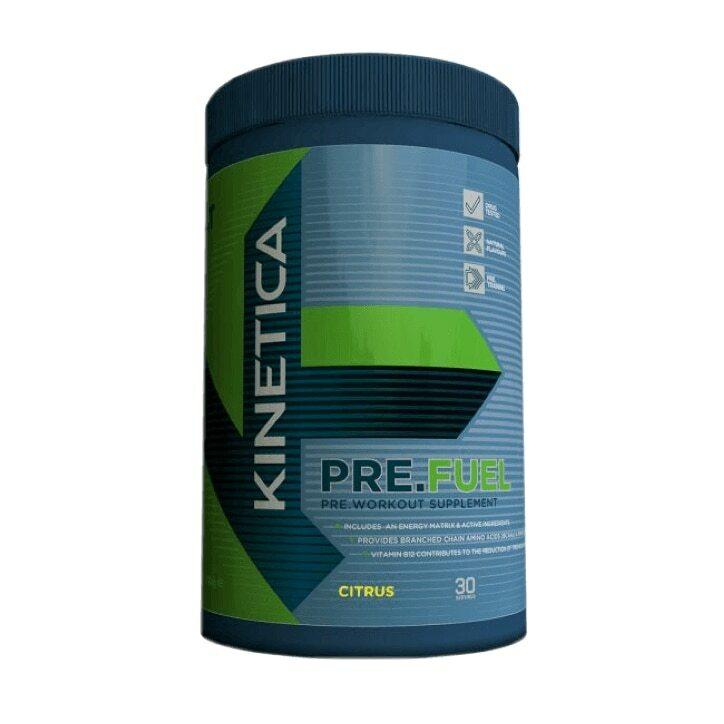 Kinetica Pre.Fuel has been specially formulated by leading sports specialists and manufactured from high quality ingredients to create an expert pre-workout supplement. Our Pre Fuel formulation is designed for serious sportspersons to ensure they have the best nutrient support prior to training. Pre.Fuel contains valuable branched chain amino acids (BCAAs) and an amino blend containing citrulline malate, beta alanine, l carnitine l tartrate and taurine. In addition it also provides conditionally essential amino acids, l arginine, known as a precursor to nitric oxide synthesis and l tyrosine. Other actives include a B vitamin blend along with key minerals calcium, magnesium and enhanced with 94mg of caffeine. It contains no added sugar and is free of artificial flavours, colours and gluten. Vitamin B12 contributes to the reduction of tiredness contributes and Niacin contributes to normal energy-yielding metabolism. Calcium and Magnesium contribute to normal muscle function and the maintenance of normal bones. Pre.Fuel is gluten free, contains no added sugar and is free of artificial flavours and colours, making a great tasting drink – just add to water. Beta Alanine may cause skin tingling. Pregnant women should consult a GP before use. If you are suffering from a medical condition, please consult your GP. This product is not intended to treat illness. Please do not exceed the recommended dose. Supplements should not be used as a substitute for a balanced diet.